Inoculation of mango trees with Burkholderia caribensis XV and Rhizobium sp. XXV led to mango growth promotion (dry biomass increased in root 89 %, stem 34 %, leaves 51 %, and foliar area 53 %), floral fate (floral buds 100 %), and increased number of flowers (100 %). Nitrogen content in leaves was similar in inoculated and noninoculated trees, around 1.4 % (optimal condition for floral induction). The total foliar nitrogen content increased significantly (56 %) when the microbial inoculation treatment was applied. In addition, the initial content of sucrose, glucose, and fructose in leaves was higher in the microbial inoculation treatment trees but decreased during the evaluated period. The sucrose content in the noninoculated trees presented similar dynamics compared to the microbial inoculation treatment trees, but glucose and fructose showed increased values compared to those of the microbial inoculation treatment. FLOWERING LOCUS T (FT) expression profiles normalized to ACTIN showed similar dynamics but different expression levels: RQ values of 0.03 and 0.05 for noninoculated and microbial inoculation treatments, respectively. In addition, FT expression profiles in microbial inoculation, normalized to the noninoculated treatment, showed an increased FT expression dynamic over time (up to RQ = 2.2), although a drastic decrease in the last sampling date, when all trees presented developed panicles and flowers, was observed. This FT upregulation was in accordance with the flowering induction in that treatment. Temperature had an important influence on mango flowering induction, which was observed for a 1-month period (~10 °C at night and 20 °C during the day). Bud growth that occurred during that period generated mixed and floral buds depending on the exposure time to these inductive temperatures, less than 2 weeks and more than 3 weeks, respectively. 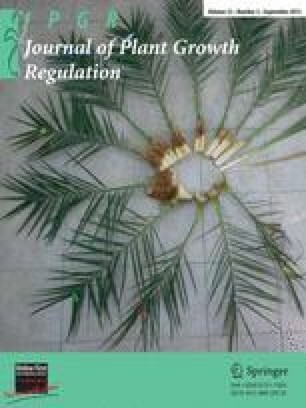 Data indicate that inoculation of mango trees with plant growth-promoting rhizobacteria (associated with this crop) is a potential alternative way to promote growth and induce flowering in mango, greatly reducing the high economical costs and environmental contamination associated with traditional agricultural practices. We thank Dr. Jorge Molina Torres and MC. Enrique Ramírez Chavez for their help with the carbohydrate quantification by GC-MS, and to IB. Fannie Isela Parra Cota for her help with real-time PCR analysis.